An architectural survey training course began at the Ta Nei temple in Angkor as a new human resource development project based on a cooperation agreement with the Cambodian government’s Authority for the Protection and Management of Angkor and the Region of Siem Reap (ASPARA). 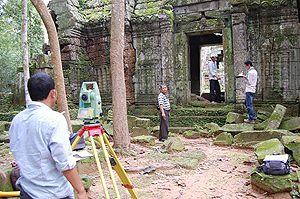 This training course provides a combination of classroom lectures and field practices, with the goal of learning by the Cambodian staffs the basic sequence of steps for surveying architectural remains using GPS and a total station and CAD drawing. This was the first of four planned training courses through the next fiscal year. Twelve young and core staff members, who specialize in architecture and archeology, from the ASPARA, the Preah Vihear National Authority and the JASA team participated in the training, which took place for five days from July 30 through August 3. The trainees were all enthusiastically making an effort to learn the skills. The current goal is to complete an up-to-date planimetric map of the entire temple complex.